Absolute monarchy is a form of monarchy in which the monarch holds supreme authority and where that authority is not restricted by any written laws, legislature, or customs. These are often hereditary monarchies. In contrast, in constitutional monarchies, the head of state's authority derives from and is legally bounded or restricted by a constitution or legislature. Some monarchies have a weak or symbolic legislature and other governmental bodies the monarch can alter or dissolve at will. Countries where monarchs still maintain absolute power are: Brunei, Oman, Saudi Arabia, Eswatini, Vatican City and the individual emirates composing the United Arab Emirates, which itself is a federation of such monarchies – a federal monarchy. In Ancient Egypt, the Pharaoh wielded absolute power over the country and was considered a living god by his people. In ancient Mesopotamia, many rulers of Assyria, Babylonia and Sumer were absolute monarchs as well. In ancient and medieval India, rulers of the Maurya, Satavahana, Gupta, Chola and Chalukya Empires, as well as other major and minor empires, were considered absolute monarchs. In the Khmer Empire, the kings were called "Devaraja" and "Chakravartin" (King of the world), and exercised absolute power over the empire and people. Throughout Imperial China, many emperors and one empress wielded absolute power through the Mandate of Heaven. In pre-Columbian America, the Inca Empire was ruled by a Sapa Inca, who was considered the son of Inti, the sun god and absolute ruler over the people and nation. Korea under the Joseon dynasty and short-lived empire was also an absolute monarchy. In the Ottoman Empire, many sultans wielded absolute power through heavenly mandates reflected in their title, the "Shadow of God on Earth". 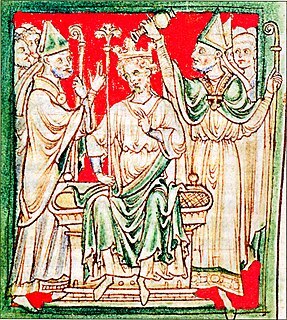 Throughout much of European history, the divine right of kings was the theological justification for absolute monarchy. Many European monarchs, such as those of Russia, claimed supreme autocratic power by divine right, and that their subjects had no rights to limit their power. James VI of Scotland (later also James I of England) and his son Charles I of Scotland and England tried to import this principle. Charles I's attempt to enforce episcopal polity on the Church of Scotland led to rebellion by the Covenanters and the Bishops' Wars, then fears that Charles I was attempting to establish absolutist government along European lines was a major cause of the English Civil War, despite the fact that he did rule this way for 11 years starting in 1629, after dissolving the Parliament of England for a time. By the 19th century, the Divine Right was regarded as an obsolete theory in most countries in the Western world, except in Russia where it was still given credence as the official justification for the Tsar's power until February Revolution in 1917. Nothing so clearly indicates the limits of royal power as the fact that governments were perennially in financial trouble, unable to tap the wealth of those ablest to pay, and likely to stir up a costly revolt whenever they attempted to develop an adequate income. The King of France concentrated in his person legislative, executive, and judicial powers. He was the supreme judicial authority. He could condemn people to death without the right of appeal. It was both his duty to punish offenses and stop them from being committed. From his judicial authority followed his power both to make laws and to annul them. One of his steps in creating an absolute monarchy in France was to build the Palace of Versailles, where he lived with many of his nobles and other important people, in order to control and watch over them. Absolutism was underpinned by a written constitution for the first time in Europe in 1665 Kongeloven ("King's Law") of Denmark-Norway, which ordered that the Monarch "shall from this day forth be revered and considered the most perfect and supreme person on the Earth by all his subjects, standing above all human laws and having no judge above his person, neither in spiritual nor temporal matters, except God alone". This law consequently authorized the king to abolish all other centers of power. Most important was the abolition of the Council of the Realm. In Brandenburg-Prussia, the concept of absolute monarch took a notable turn from the above with its emphasis on the monarch as the "first servant of the state", but it also echoed many of the important characteristics of Absolutism. Frederick William (r. 1640–1688), known as the Great Elector, used the uncertainties of the final stages of the Thirty Years' War to consolidate his territories into the dominant kingdom in northern Germany, whilst increasing his power over his subjects. His actions largely originated the militaristic streak of the Hohenzollern. In 1653 the Diet of Brandenburg met for the last time and gave Frederick William the power to raise taxes without its consent, a strong indicator of absolutism. [disputed – discuss] Frederick William enjoyed support from the nobles, who enabled the Great Elector to undermine the Diet and other representative assemblies. The leading families saw their future in cooperation with the central government and worked to establish absolutist power. The most significant indicator of the nobles' success was the establishment of two tax rates – one for the cities and the other for the countryside – to the great advantage of the latter, which the nobles ruled. The nobles served in the upper levels of the elector's army and bureaucracy, but they also won new prosperity for themselves. The support of the Elector enabled the imposition of serfdom and the consolidation of land holdings into vast estates which provided for their wealth. They became known as Junkers (from the German for young lord, junger Herr). Frederick William faced resistance from representative assemblies and long-independent cities in his realm. City leaders often revolted at the imposition of Electorate authority. The last notable effort was the uprising of the city of Königsberg which allied with the Estates General of Prussia to refuse to pay taxes. Frederick William crushed this revolt in 1662, by marching into the city with thousands of troops. A similar approach was used with the towns of Cleves. Until 1905 the Tsars and Emperors of Russia governed as absolute monarchs. Peter I the Great reduced the power of the Russian nobility and strengthened the central power of the monarch, establishing a bureaucracy and a police state. This tradition of absolutism, known as Tsarist autocracy, was expanded by Catherine II the Great and her descendants. Although Alexander II made some reforms and established an independent judicial system, Russia did not have a representative assembly or a constitution until the 1905 Revolution. However, the concept of absolutism was so ingrained in Russia that the Russian Constitution of 1906 still described the monarch as an autocrat. Russia became the last European country (excluding Vatican City) to abolish absolutism, and it was the only one to do so as late as the 20th century (the Ottoman Empire drafted its first constitution in 1877). The form of government instituted in Sweden under King Charles XI and passed on to his son, Charles XII is commonly referred to as absolute monarchy; however, the Swedish monarch was never absolute in the sense that he wielded arbitrary power. The monarch still ruled under the law and could only legislate in agreement with the Riksdag of the Estates; rather, the absolutism introduced was the monarch's ability to run the government unfettered by the privy council, contrary to earlier practice. The absolute rule of Charles XI was instituted by the crown and the Riksdag in order to carry out the Great Reduction which would have been made impossible by the privy council which comprised the high nobility. After the death of Charles XII in 1718, the system of absolute rule was largely blamed for the ruination of the realm in the Great Northern War, and the reaction tipped the balance of power to the other extreme end of the spectrum, ushering in the Age of Liberty. After half a century of largely unrestricted parliamentary rule proved just as ruinous, King Gustav III seized back royal power in the coup d'état of 1772, and later once again abolished the privy council under the Union and Security Act in 1789, which, in turn, was rendered void in 1809 when Gustav IV Adolf was deposed in a coup and the constitution of 1809 was put in its place. The years between 1789 and 1809, then, are also referred to as a period of absolute monarchy. The popularity of the notion of absolute monarchy declined substantially after the French Revolution, which promoted theories of government based on popular sovereignty. Many nations formerly with absolute monarchies, such as Jordan, Kuwait and Morocco, have moved towards constitutional monarchy, although in some cases the monarch retains tremendous power, to the point that the parliament's influence on political life is negligible. In Bhutan, the government moved from absolute monarchy to constitutional monarchy following planned parliamentary elections to the Tshogdu in 2003, and the election of a National Assembly in 2008. Nepal had several swings between constitutional rule and direct rule related to the Nepalese Civil War, the Maoist insurgency, and the 2001 Nepalese royal massacre, with the Nepalese monarchy being abolished on May 28, 2008. In Tonga, the King had majority control of the Legislative Assembly until 2010. On the other hand, Liechtenstein has moved towards expanding the power of the monarch: the Prince of Liechtenstein was given expanded powers after a referendum amending the Constitution of Liechtenstein in 2003, which led the BBC to describe the prince as an "absolute monarch again". The ruling Kim family of North Korea (Kim Il-sung, Kim Jong-il and Kim Jong-un) has been described as a de facto absolute monarchy or "hereditary dictatorship". In 2013, Clause 2 of Article 10 of the new edited Ten Fundamental Principles of the Korean Workers' Party states that the party and revolution must be carried "eternally" by the "Baekdu (Kim's) bloodline". Saudi Arabia is an absolute monarchy, and according to the Basic Law of Saudi Arabia adopted by royal decree in 1992, the king must comply with Shari'a (Islamic law) and the Qur'an. The Qur'an and the corpus of Sunnah (traditions of the Islamic prophet, Muhammad) are declared to be the Kingdom's constitution, but no written modern constitution has ever been written for Saudi Arabia, which remains one of two Arab nations where no national elections have ever taken place since its founding, with the other being Qatar. No political parties or national elections are permitted and according to The Economist's 2010 Democracy Index, the Saudi government is the seventh most authoritarian regime from among the 167 countries rated. Anthropology, sociology, and ethology as well as various other disciplines such as political science attempt to explain the rise of absolute monarchy ranging from extrapolation generally, to certain Marxist explanations in terms of the class struggle as the underlying dynamic of human historical development generally and absolute monarchy in particular. In the 17th century, French legal theorist Jean Domat defended the concept of absolute monarchy in works such as "On Social Order and Absolute Monarchy", citing absolute monarchy as preserving natural order as God intended. ^ Goldie, Mark; Wokler, Robert. "Philosophical kingship and enlightened despotism". The Cambridge History of Eighteenth-Century Political Thought. Cambridge University Press. p. 523. ISBN 9780521374224. Retrieved 13 January 2016. ^ Leopardi, Giacomo (2013) [original 1898]. Zibaldone. Farrar Straus Giroux. p. 1438. ISBN 978-0374296827. ^ Nathanial Harris (2009). Systems of Government Monarchy. Evans Brothers. p. 10. ISBN 978-0-237-53932-0. ^ "Qatar: regional backwater to global player". BBC News. ^ "Q&A: Elections to Oman's Consultative Council". BBC News. ^ a b c Cavendish, Marshall (2007). World and Its Peoples: the Arabian Peninsula. p. 78. ISBN 978-0-7614-7571-2. ^ "Swaziland profile". BBC News. ^ "State Departments". Vaticanstate.va. Retrieved 2014-01-25. ^ a b "Vatican to Emirates, monarchs keep the reins in modern world". Times of India. ^ Mettam, Roger. Power and Faction in Louis XIV's France, 1991. ^ "Louis XIV". HISTORY. Retrieved 2018-10-05. ^ Mettam, R. Power and Faction in Louis XIV's France, Oxford: Basil Blackwell, 1988. ^ Mousnier, R. The Institutions of France under the Absolute Monarchy, 1598-2012 V1. Chicago: The University of Chicago Press, 1979. ^ Holt World History. France in the Age of Absolutism Austin: Rinehart and Winston, 2003. ^ "Kongeloven af 1665" (in Danish). Danske konger. Archived from the original on 2012-03-30. ^ A partial English translation of the law can be found in Ernst Ekman, "The Danish Royal Law of 1665" pp. 102-107 in: The Journal of Modern History, 1957, vol. 2. ^ The Western Experience, Seventh Edition, Boston: McGraw-Hill, 1999. ^ "Liechtenstein prince wins powers". BBC News. 2003-03-16. Retrieved 2015-10-26. ^ Young W. Kihl, Hong Nack Kim. North Korea: The Politics of Regime Survival. Armonk, New York, USA: M. E. Sharpe, Inc., 2006. Pp 56. ^ Robert A. Scalapino, Chong-Sik Lee. The Society. University of California Press, 1972. Pp. 689. ^ Bong Youn Choy. A history of the Korean reunification movement: its issues and prospects. Research Committee on Korean Reunification, Institute of International Studies, Bradley University, 1984. Pp. 117. ^ Sheridan, Michael (16 September 2007). "A tale of two dictatorships: The links between North Korea and Syria". The Times. London. Retrieved 9 April 2010. ^ Government of Brunei. "Prime Minister". The Royal Ark. Office of the Prime Minister. Archived from the original on 7 October 2011. Retrieved 12 November 2011. ^ Sultan Qaboos Centre for Islamic Culture. "About H.M the Sultan". Government of Oman, Diwan of the Royal Court. Archived from the original on 18 January 2012. Retrieved 12 November 2011. ^ Nyrop, Richard F (2008). Area Handbook for the Persian Gulf States. Wildside Press LLC. p. 341. ISBN 978-1-4344-6210-7. ^ BBC News, How democratic is the Middle East?, 9 September 2005. ^ United States Department of State Country Reports on Human Rights Practices for 2011: Qatar, 2011. ^ Government of Qatar. "H.H. The Amir's Biography". Diwan of the Amiri Court. Archived from the original on 2 December 2011. Retrieved 12 November 2011. ^ "Saudi Arabia's King Abdullah dies". BBC News. 23 January 2015. Retrieved 23 January 2015. ^ "Argentina's Jorge Mario Bergoglio elected Pope". BBC News. Retrieved 13 March 2013. ^ Robbers, Gerhard (2007). Encyclopedia of world constitutions, Volume 1. p. 791. ISBN 0-8160-6078-9. ^ The Economist Intelligence Unit. "The Economist Democracy Index 2010" (PDF). The Economist. Retrieved 6 June 2011. ^ "Jean Domat: On Defense of Absolute Monarchy - Cornell College Student Symposium". 18 April 2009. Anderson, Perry. Lineages of the Absolutist State. London: Verso, 1974. Kimmel, Michael S. Absolutism and Its Discontents: State and Society in Seventeenth-Century France and England. New Brunswick, NJ: Transaction Books, 1988. Méttam, Roger. 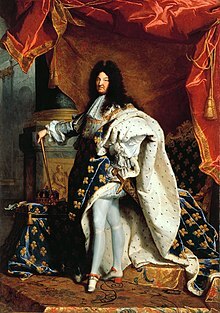 Power and Faction in Louis XIV's France. New York: Blackwell Publishers, 1988. Miller, John (ed.). Absolutism in Seventeenth Century Europe. New York: Palgrave Macmillan, 1990. Wilson, Peter H. Absolutism in Central Europe. New York: Routledge, 2000. A monarchy is a form of government in which a single person holds supreme authority in ruling a country, also performing ceremonial duties and embodying the country's national identity. Although some monarchs are elected, in most cases, the monarch's position is inherited and lasts until death or abdication. In these cases, the royal family or members of the dynasty usually serve in official capacities as well. The governing power of the monarch may vary from purely symbolic, to partial and restricted, to completely autocratic. A monarch is the head of a monarchy, a form of government in which a state is ruled by an individual who normally rules for life or until abdication, and typically inherits the throne by birth. Monarchs may be autocrats or may be ceremonial figureheads, exercising only limited or no reserve powers at all, with actual authority vested in a legislature and/or executive cabinet. In many cases, a monarch will also be linked with a state religion. Most states only have a single monarch at any given time, although a regent may rule when the monarch is a minor, not present, or otherwise incapable of ruling. Cases in which two monarchs rule simultaneously over a single state, as is the current situation in Andorra, are known as coregencies. The Trienio Liberal is a period of three years in the modern history of Spain between 1820 and 1823, when a liberal government ruled Spain after a military uprising in January 1820 by the lieutenant-colonel Rafael de Riego against the absolutist rule of Ferdinand VII. The Political Constitution of the Spanish Monarchy, also known as the Constitution of Cádiz and as La Pepa, was the first Constitution of Spain and one of the earliest constitutions in world history. It was established on 19 March 1812 by the Cortes of Cádiz, the first Spanish legislature. 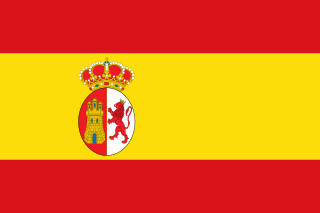 With the notable exception of proclaiming Roman Catholicism as the official and sole legal religion in Spain, the constitution was one of the most liberal of its time: it affirmed national sovereignty, separation of powers, freedom of the press, free enterprise, abolished feudalism, and established a constitutional monarchy with a parliamentary system. It was one of the first constitutions that allowed universal male suffrage, through a complex indirect electoral system. It was repealed by King Ferdinand VII in 1814 in Valencia, who re-established absolute monarchy. Church and State in medieval Europe includes the relationship between the Catholic Church and the various monarchies and other states in Europe, between the end of Roman authority in the West in the fifth century and the beginnings of the Reformation in the early sixteenth century. The relationship between the Church and the feudal states during the medieval period went through a number of developments. The struggles for power between kings and popes shaped the western world. Monarchy was the prevalent form of government in the history of Europe throughout the Middle Ages, only occasionally competing with communalism, notably in the case of the Maritime republics and the Swiss Confederacy. This is a list of current monarchies. 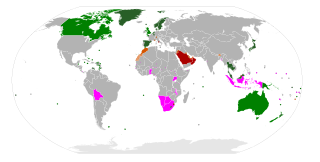 As of 2018, there are some 45 sovereign states in the world with a monarch as Head of state.